So today is the last day to donate to my Movember Campaign and win some awesome cigars from either the Maldonado Dynasty or my Personal Humidor! There are a total of 5 Prizes up for grabs. Check out my post from last week for the details. The winners will be announced on Friday! Good luck to everyone who donated and thanks for the support! Today’s review comes courtesy of Lou B. who you can find in the comments section every now and then. I met Lou at a herf a little while back and he’s been holding some awesome Cigar-B-Cue’s where we eat, smoke, drink and talk. 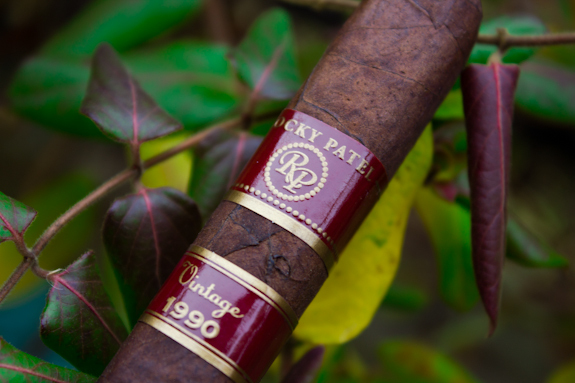 At the last little gathering, Lou handed me a Rocky Patel Vintage 1990 and said that I had to try it and squeeze in a review if possible. We chatted a little about how my history with most Rocky Patel sticks is a little shaky but I would give it a shot. So here I am today about to light up this cigar. I have had a few Vintage 1990’s a while ago but it’s been a rather long time so other than a few notes I made for myself I don’t have much to go on. I actually decided to ignore my old notes and go at this one blindly! 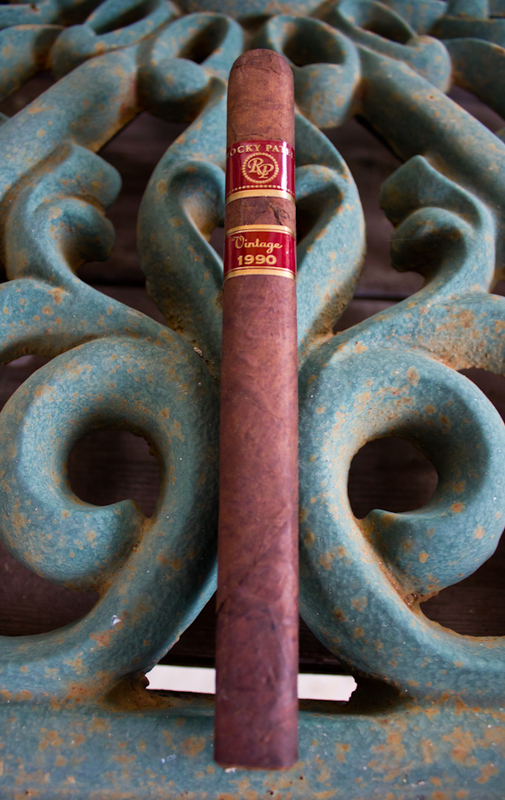 The Rocky Patel Vintage 1990 is the oldest cigar in his vintage line. 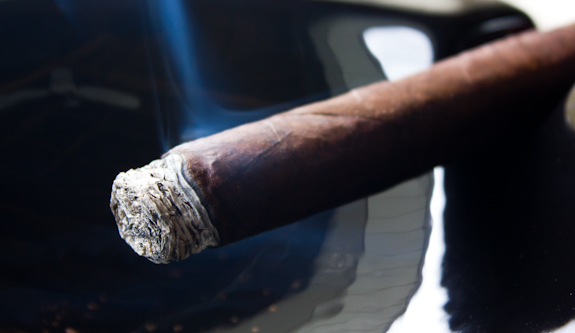 This particular blend is made with Maduro Broadleaf wrapper dating back to 1990. So the wrapper on these cigars is near 12 Years old and apparently the filler is at least 5 years old before being rolled. That makes for a very well aged cigar right out of the box so let’s hope it has the smoothness you would expect on such a well aged smoke. It seems that the Vintage 1990 line is also available in a wide variety of vitolas that come boxed in quantities of 20. I even stumbled upon some being sold as bundles so you can save a few dollars there too. The vitola Lou gifted me with happens to be their Churchill which also has a box-pressed look to it. 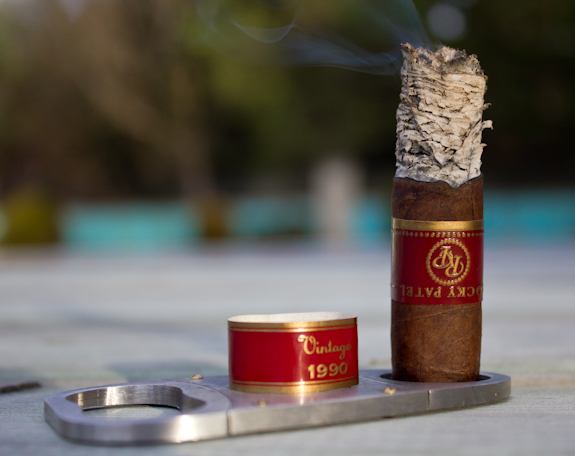 The cigar also seems a lot smaller than the claimed 48 ring gauge, possibly due to the pressing. I’d say this cigar is almost around 42 or 44 ring gauge from a quick glance. 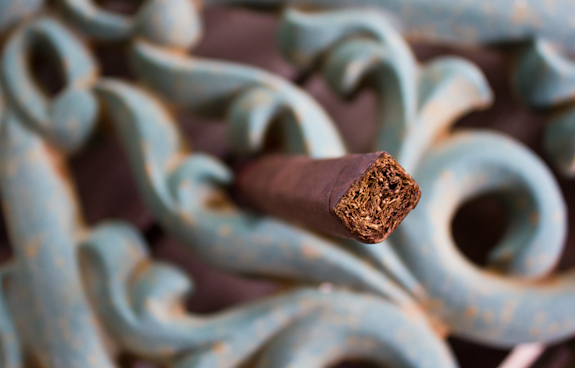 Now this cigar also has quite the reputation which can sometimes hinder a cigar. It’s been given a 92 rating by Cigar Aficionado and even been named to the Top 25 Cigars of the year twice. So this sets the bar fairly high when you read something like that before lighting up. But regardless of that, I’m going into this review with a clear mind and hoping for a good smoke. This one’s for you Lou! •	Still more nothing to report, lol. No wavy lines, no canoes, no tunnels, just the way I like it! So I have to admit I came into this cigar with some hesitation due to my past experiences with Rocky Patel sticks. I’ve had a few good ones, but most were not in my flavor profile. Even with Lou’s claims of how much he enjoyed this I was a little worried. I’m happy to report that I enjoyed this cigar! I wouldn’t put it into my top 10 but I would keep it on regular rotation as a reliable mild/medium bodied stick if I can find it on sale or maybe in the bundles. It had an interesting set of flavors that were very well balanced and it burned superbly. I don’t really have anything negative to say. If there was one critique I could make it’s that the flavors were not very pronounced. They were there, but you really had to sit and concentrate to pick up on them. Maybe this is due to their extended aging? I’m not too sure… You could easily enjoy it’s smoothness without paying attention, but if the flavor were a little more intense, this might have been a top 10 contender for me. It’s no secret that I’m a HUGE fan of the Innis & Gunn Brewery and everything I’ve tried from them to date. Their Oak Aged Beers are simply the best I’ve been able to find so far with a sweet caramely smoothness. Every year they also come out with a Winter Seasonal, and as I mentioned in my last review, I’m a bit of a sucker for Winter Seasonals. So I had to get this, their Winter Beer 2011! The crappy part is that it’s only available in a Sampler pack here. Although I really enjoy their other beers in the sampler, it comes with a glass. I think I’m up to 5 or 6 Innis & Gunn glasses now because I keep buying the sampler packs they have for their seasonal beers… lol. But enough about my ranting, this beer keeps to my expectations for this brewery and brings a TON of flavor to the table. Along with the classic Oaky notes, you can pick up some citrus, vanilla, toffee and the signature caramel smoothness. 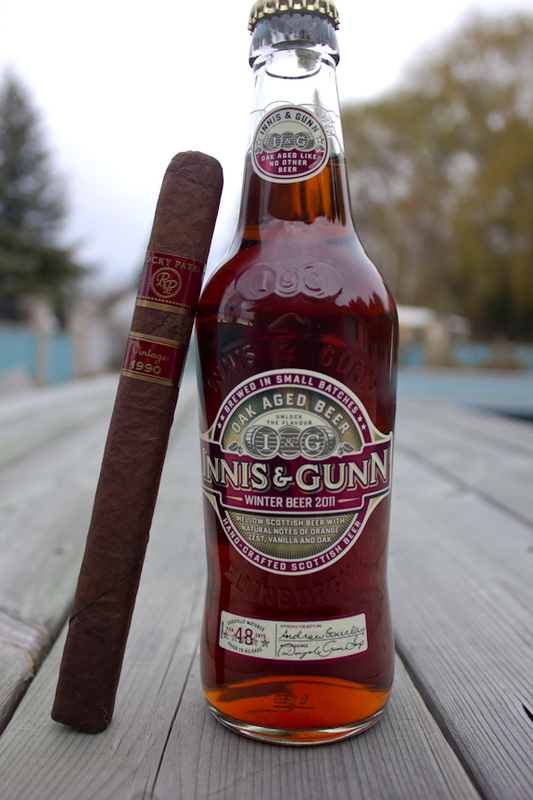 All of their beers seem to pair best with a good mild or medium bodied cigar, so it fit very well in with the Rocky Patel Vintage 1990. Other good pairing would be a similar beer like a blonde or amber, and possibly a nice cup of coffee. Great job once again, Daniel. I’m the same when it comes to RPs. I’ve only found maybe one or two that I would smoke again. I’ve wondered about these and the ’92s for awhile. Now I feel more confident in trying one. Great Review! I have the Vintage 1990 and the 1992 in my humidor right now…wife brought them back from her last gals Vegas trip…looking forward even more now to smoking both and comparing. Let us know how the ’92 compares once you get a chance to smoke both. I’m curious as well! Nice reviw DT! I’ve got a 1990 robusto in the humi I got back in august. I love the Edge stick from RP. I recently had the missle, I think its a better smoke than the robusto to be honst. For me its a strong coffee or a scotch smoke. I also picked up an Old World Reserve. The Edge Sumatra was a pretty good stick but the other Edge didn’t do it for me. Olde world Reserve was disappointing too… Like i said, I haven’t had great luck with RP’s but everyone’s profile is different, you might love it. Lol! It was fun! Its a close 2nd to when mom brings out the orange slices at soccer. You were probably like, “WTH is this guy talking about smoking after hockey?” lol. Great review, Snidely, I mean Daniel! I haven’t had many RP’s, but I did have one of these a few months ago, and I think your review was pretty much spot on. I see this as an enjoyable earlier in the day smoke I’ve thought about picking up a bundle of the 2nds at some point in the future. I’ll have to look for that beer around here. Is it fairly pricy? No photo update on your stache this week? Or are you waiting until the drive is over to spring the final product on us? The normal Oak Aged Beer beer sells for about $3.50 here, their special editions usually carry a slightly higher price tag. I’ve told Tony to look for anything by Innis & Gunn but none of his local places carry it, I guess it’s hard to come by. Photo update will be in the winners post coming on Friday! The last pic before the razor get’s to tangle with the stash! I know I have read about it being available in the states, just not in my area yet. I have a knack for hunting beer down, and I’m sure I’ll run into it sooner or later. In the meantime, you may have better luck than I! You should have your own Discovery show – “Beer Hunter”! Well Daniel, I’m glad you enjoyed the RP Vintage 1990. I loved that cig the first time; and that’s why I bought a box. I don’t know if I would call it a mild/med type of smoke though. 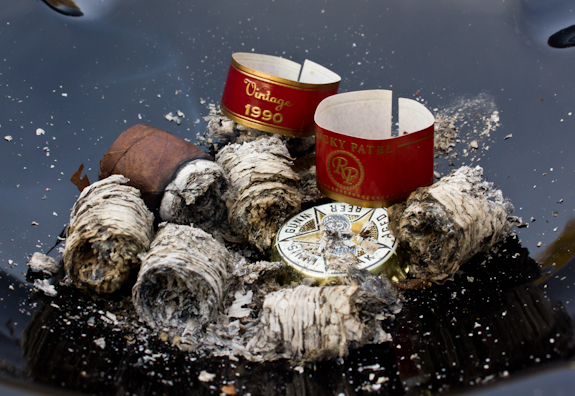 I feel that as we smoke more cigars we need the fuller bodied smokes to peak our interest and keep us on our toes. Thanks for doing this review, I appreciate it Daniel T.
I was at a point where I said that I’d never had a RP cigar that I didn’t love. Well, last Sunday I had a RP 15th Anniversary. That was not a love fest. 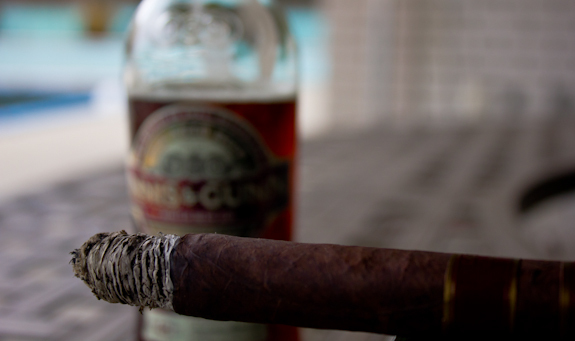 So you see, not everyone is perfect and neither is every cigar. All the best to the RP fans!!! 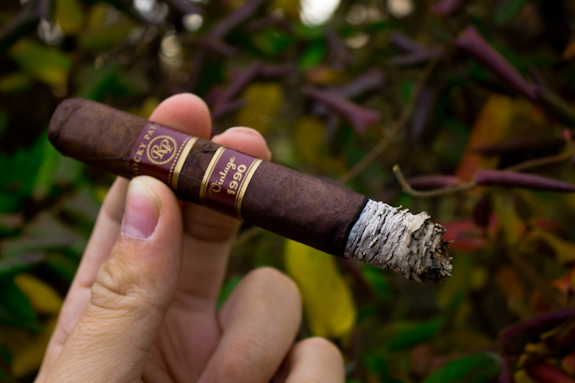 Hello Daniel, as always great, honest, insightful, review and as you also know, I am the Rocky Patel freakazoid for Southern Ontario, I have pretty much tried all his creations and currently carry 6 different blends in my humidors at home. My 3 favorite RP all time would be “RP The Edge” Toro size, “RP Vintage 1990” ( size you just reviewed ) and “1961”, I just received some “RP Vintage 2003” Camroon’s and the first one I tried was a taste treat indeed, great with Dalwhinny 15 year old scotch…but then what isn’t good with scotch. Like Lou mentioned in the reply above, I myself purchased a box of “RP 15th Anniversary” and have tried two now to quite some sad, sad, sad, disapointment, these are made at a Nicaraguan facility which might be why they taste so different I am hoping some aging will improve their worth. Anyway my reason for this E-mail….As you know this Friday Lee Douglas of Fat City Cigar Lounge is having a Cigar party, hope you can make it to this event, as we discussed at the last Cigarbaque in Rockwood, I have 3 Montecristo Open Master’s left from the box I picked up in Cuba a half year ago and one of them is yours pal, it is one of my 3 favorite Cuban blends by far, call it a present for actually saying something nice about Rocky. I did see the email about Lee’s bash and I hope to make it out there on Friday! I have a couple sticks waiting for you as well!